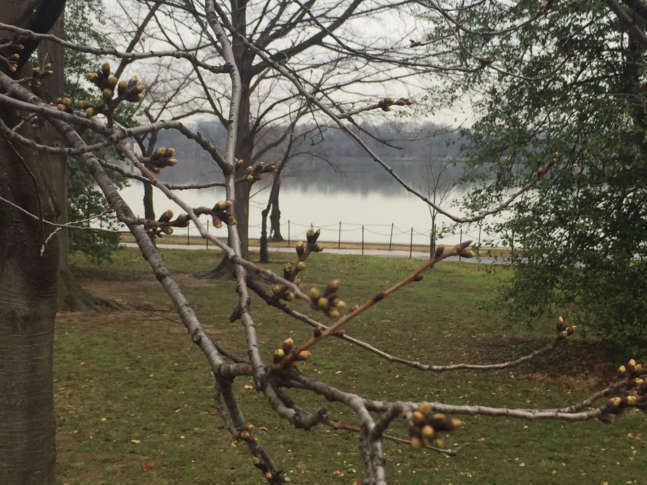 Find out when 70 percent of the cherry blossoms along the Tidal Basin will be in bloom. WASHINGTON — Forget what the groundhog said. Spring in D.C. is marked by when the cherry blossoms start to pop. And this year, spring looks like it’ll be coming a bit early. The National Park Service announced Thursday the projected peak date for the cherry blossoms along the Tidal Basin will be March 17 to March 20. On that date, the Park Service believes the Yoshino cherry trees will be at their most brilliant this year. That would be the earliest peak bloom date since 1990, when cherry blossom buds popped open March 15, and the second earliest on record, since the cherry trees were planted in 1912, according to the National Park Service. There are already signs of spring. Peak bloom is defined as when 70 percent of the cherry blossoms along the Tidal Basin are in bloom. Still, a lot can happen in the next two weeks. A strong cold snap could end up pushing back peak bloom. Conversely, a stretch of warmer-than-expected temperatures could speed up the blooming process. “The developments are dependent on the weather conditions,” Cucurullo cautioned. Last year, peak bloom was expected starting as early as March 19. However, a mid-March plunge into subfreezing temperatures just days before the forecast peak bloom date destroyed many of the buds. Over the years, the average peak blooms has occurred right around the beginning of April. Unless you’re a fan of winter. And if that’s the case, the buds on the branches are suggesting this year may not be for you. This year’s National Cherry Blossom Festival spans March 20 to April 15. WTOP’s Jack Moore contributed to this report.